FiberTite® roofing membrane withstands weather and jet fuel residue at Budget Rent-A-Car near Miami airport. FiberTite® was specified for the new roof at Budget Rent-A-Car, Miami International Airport, for one simple reason: proven perfomance. No other single-ply membrane can withstand Florida’s blistering, sub-tropical sunshine like FiberTite. No other single-ply membrane matches FiberTite’s long-term resistance to the ravages of jet fuel and other chemical fallout. And no other single-ply membrane has FiberTite’s proven strength and durability to weather Dade County’s hurricane-strength winds and torrential rains. 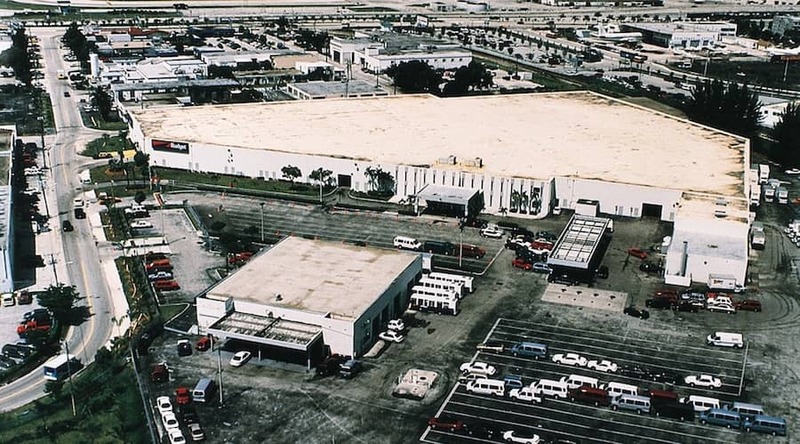 The Budget facility sits practically on the runway of Miami’s busy International Airport. Given the location, the climate and the building’s primary use, the 186,000 square-foot roof has to handle a great deal of abuse. So, when Budget evaluated their options for the re-roofing project, they were looking for a roofing system with a track record of dependability under adverse conditions. A roof that would suffer minimal deterioration and membrane shrinkage under a constant barrage of UV radiation. A roof that would retain its integrity after years of exposure to jet fuels and other common rooftop contaminants. A roof that would defy wind uplift damage, delamination and seam failures. And a roof that could be installed within the limits of Budget’s, well, budget. That’s why Budget Rent-A-Car’s new roof is FiberTite. By Seaman Corporation.